It's the big question your friends and family might be asking: what are we doing for New Years? Here’s a look at some of the biggest events around Southwest Florida for ringing in 2019. 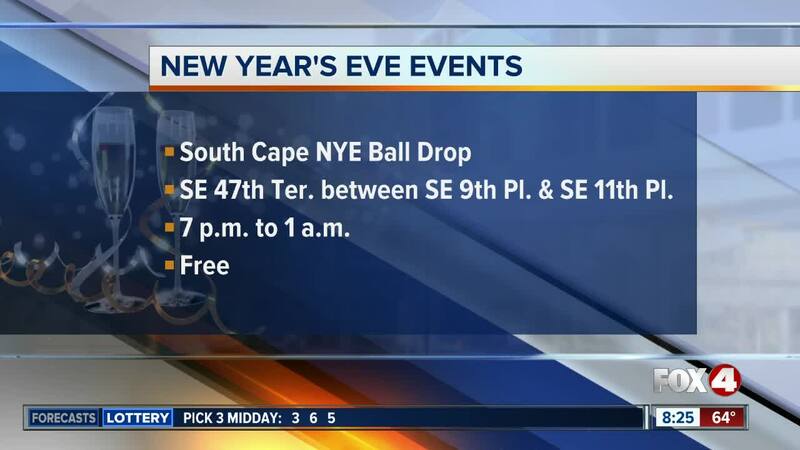 If you're in Cape Coral there will be a block party with a ball drop along Southeast 47th Terrace between Southeast 9th Place and Southeast 11th Place the excitement starts at 7 p.m. and ends at 1 a.m. It's free and fun for the whole family. Downtown Fort Myers will be holding their annual Downtown Countdown . There will be live bands, DJ's, food trucks and a ball drop, too. The event is free and runs from 8 p.m. to midnight in the river district. Fort Myers Beach is not only ringing in the new year, they are also celebrating a birthday . Events start at noon and end when the ball drops at midnight along with fireworks off the pier. The event is free. Punta Gorda is celebrating at Fisherman's Village with fireworks and live music . This event is free and runs from 6 p.m. until after midnight. In Naples there will be a fireworks celebration at the Naples Pier from 7:30 to 8 p.m. The pier will close at 5 p.m. and the fireworks will be presented from a barge just north of the pier. Your teens might need somewhere to celebrate. Sky Zone is having a New Year's Eve ‘lock in.’ There will be DJ's, games, snacks, dancing, and let's not forget: endless amounts of jumping on their trampolines. Teens ages 13 to 17 can attend. It runs from 10 p.m. to 6 a.m. and ranges from $34.99 to $49.99. Teens should bring a pillow because they will be there all night!